The natural beauty of the San Juan Islands offers visitors some of the most breathtaking views I've ever seen. The wonderful color of sunset transforms the landscape from an island paradise to something nearly impossible to describe with words. 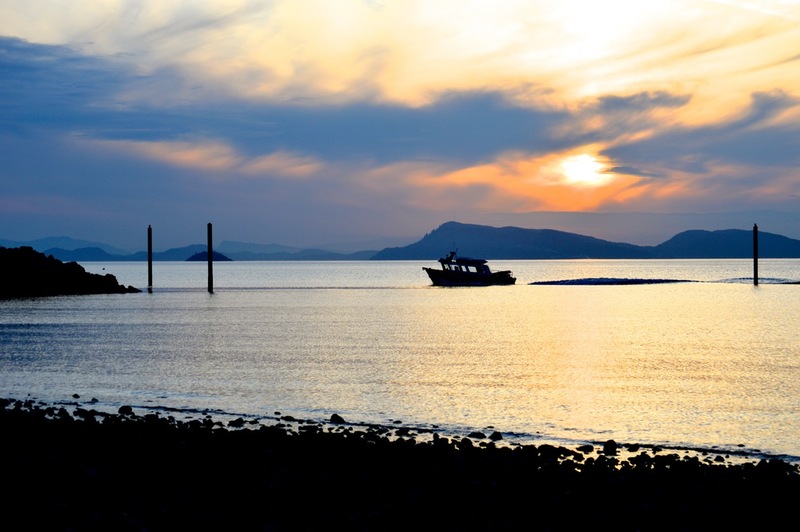 In this article, we'll share a few of our favorite spots so you can catch some amazing sunsets while you're on Orcas Island. Whether you're looking for a spot to take in the beautiful scenery with friends or loved ones, or if you're looking to capture that perfect sunset photo to share with friends and family back home or on your social accounts - we're sure to send you on the right path to accomplish those quests. We hope you enjoy the post. Let us know what you think and be sure to share your photo's with us too! You can find us on Facebook, Instagram & Twitter & other social sites here. Sunset while on a ferry from Anacortes to Orcas Island. Hopefully, you're not the type to sit in the car the entire trip to or from the San Juan Islands face glued to your phone/tablet or book. Get out and enjoy the trip across some of the most amazing scenery around. If you're lucky enough to catch a sailing during a sunset (or even sunrise), then you're in for a treat. Some of the best views I've experienced have been either sunset or sunrise ferry sailings. The amount of change in the sky in just 30-45 minutes can be truly breathtaking. 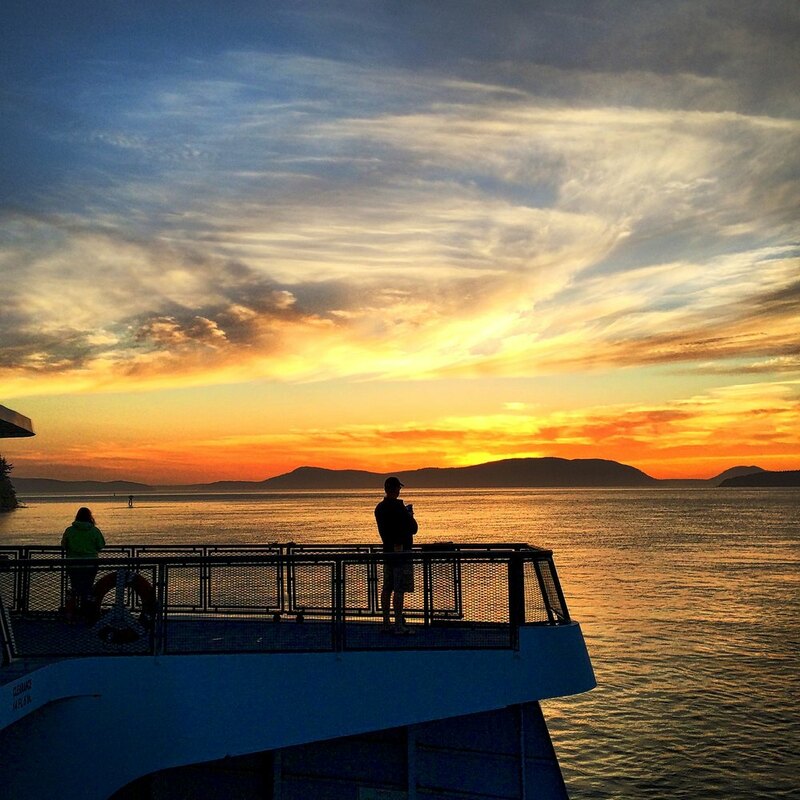 If you're on a ferry heading to the San Juan Islands, it's a great time of year anyway! Enjoy the trip! Orcas Island Getaway Tips: If you have a chance to plan your sailings, sunrise and sunset trips often offer fantastic views. Sometimes framing in the boat, the wake or even people (as in the image here) can create a more visually compelling photo. Crescent Beach offers islanders and visitors beautiful views of Ship Bay. The 3/4 mile long public beach might not capture sunsets directly (as you'll be facing south instead of west), but you will be able to have some amazing sunset effects as demonstrated in the image here. All year long, but Fall through Spring will offer a little more color as the sun will set further to the south at this time of year. Crescent Beach is easy to access. It's just a short walk from Orcas Island Getaway, or you can drive and park in one of 3 parking areas across the street from the beach. If you're looking for breathtaking views from the highest point in all of the San Juan Islands, then look no further than the top of Mount Constitution and the Observation Tower. From here, you'll see some breathtaking views, no matter the tim of day! Note that it can be much more cloudy at the top limiting views. You'll be able to catch some amazing light shining on Mt. Baker across the Salish Sea, creating some memorable photo's. Anytime - you're sure to be amazed! Just make sure there aren't too many clouds that could obstruct your views down. 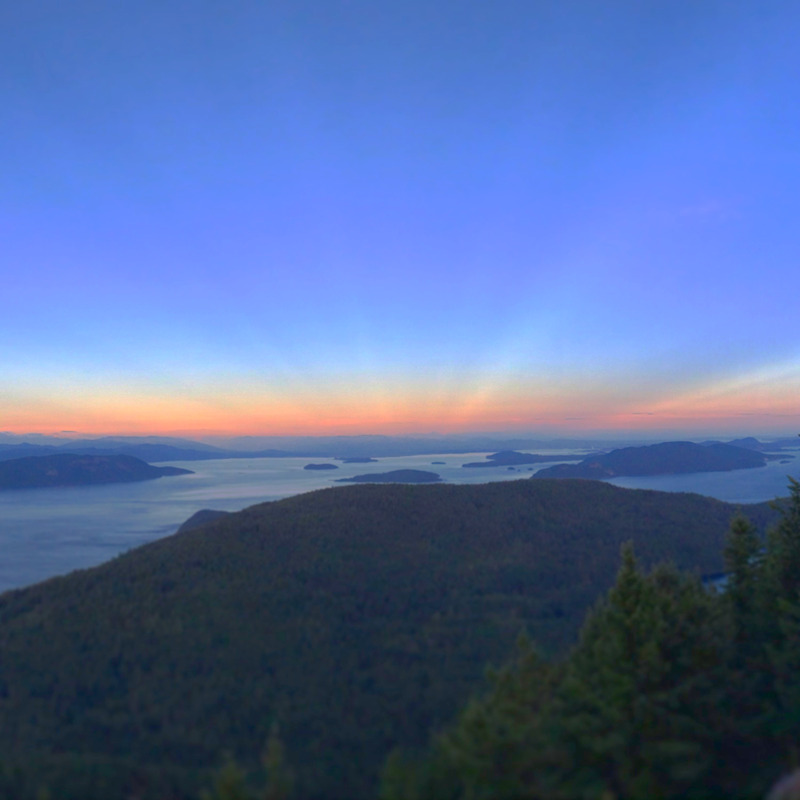 Orcas Island Getaway Tips: If you plan on going to the top of the Observation Tower, get there well before sunset and stake your spot. There isn't much room. Also, note that there are some pesky (radio/cell towers) at the top of the Mountain that can creep in your shot. If you're handy w/ photo editing software, this won't be an issue. Rays of light from sunset highlighting the face of Mt. Baker. Since the sun sets in the west, it's no wonder West Beach is such a great location to capture beautiful sunsets. Here, you'll find great views of sunsets during the fall/spring months as the sun is further south during this time of year - so it's an ideal location during off-season. Expansive views across the bay to other islands shape the horizon line, creating a dynamic depth. If you're fortunate enough to have great clouds creating additional layers of color and texture, you're sure to have some memories of a lifetime! How to get there: from Eastound, follow Enchanted Forest Road westbound until the very end of the road. Stay straight as Enchanted Forest turns left into West Beach Road, and follow the paved road to the very end. One parking spot on the left near the beach and about 3-5 spots on the right side street parking. Fall through Spring due to sun setting further south on the horizon. Orcas Island Getaway Tip: There's very limited parking at West Beach, and there are private homes to the south and a private resort to the north. Trespassing on either side for capturing your photo is frowned upon, so be sure to stay off of private property. North Beach is our favorite spot for capturing sunset photos, hands down. It's easy to access and North Beach offers a lot of variance in the types of photos you can capture from here. You'll be able to look north to Sucia and Matia Islands, westward will be Saturna Island and the sunset. During evenings with a lower tide, you'll be able to make your way further out on the beach and look east to spectacular views of Mt. Baker. From here, you'll be able to capture the sun casting it's final rays of the day on the mountainside. It'll be a hard choice on which direction you want to look! Boats entering Brandt's Landing Marina, North Beach, Orcas Island, Washington. From Eastsound, take North Beach Road traveling north to the end of the road (about 1/2 mile past of the airport). There, you'll find enough parking for approximately eight vehicles, so you'll want to get there early to stake your spot. Summer is the best time to view sunsets from North Beach as the position of the actual sun setting will make it's way over the waters edge past the piers. 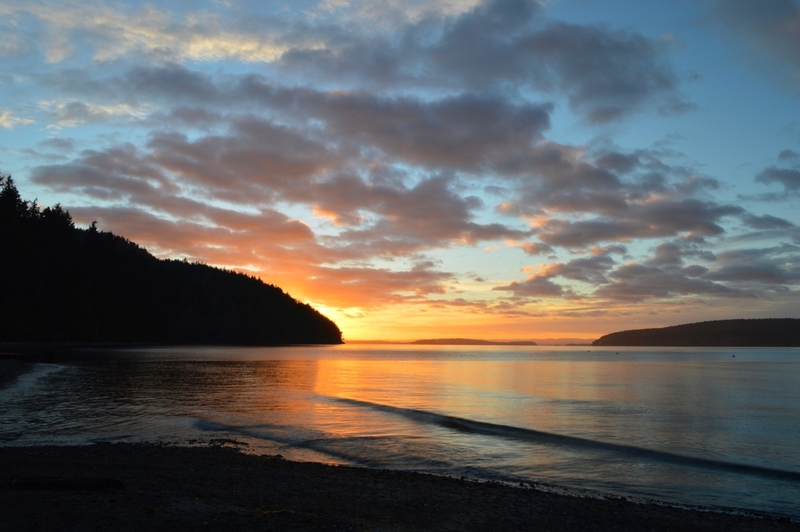 Orcas Island Getaway Tip: Spend at least one sunset at North Beach during your stay - you won't be disappointed! When sunsets turn from great to AMAZING, you need to know how to spot it before it happens! So be sure to check out this bonus article from Digital Photography School. Hopefully, you've found this article helpful in both navigating areas of Orcas Island, as well as some tips on knowing when sunsets will be breathtaking. Good luck and be sure to share your amazing captures with us - we'd love to see them. … or you can just use the form below. Thanks for reading! We respect your privacy. Unsubscribe with 1-click anytime.